Numerous experts have pointed out the rapid changes that Japanese society has been undergoing in the past few decades (see, among others, Coulmas 2007; Kingston 2011; Sugimoto 2009; Yamada 2004). While all societies change, “the pace and scope of change in Japan has been staggering and deeply unsettling in many ways for its citizens” (Kingston 2011: 20). Many of these changes are reflected in both the transformation of individual lifestyles and in Japan’s changing social reality. 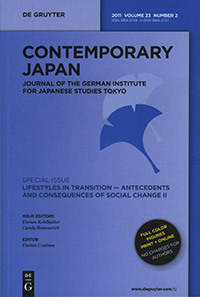 For Volume 23 of Contemporary Japan the editors invited papers that cover diverse facets of a pluralization of lifestyles witnessed in Japan in recent years. In addition to dramatic socio-economic changes, Japan is undergoing a shift from “solid” to “liquid” modernity (Bauman 2007) in which frames of reference for life planning and individual action have become blurred and multiplied. The two issues approach the topic of lifestyles in transition from various angles. Themes covered in Issue 1 indicate the scope of the subject matter and the multiplicity of areas where these transitions can be witnessed. The five papers, nevertheless, share a common analytical frame relating to struggles in identity formation and life design solidification in times of change and liquidization. Issue 2 focuses on changing lifestyles in relation to work and employment. The contributions to the second issue cover labor economics and institutional employment practices as well as popular culture/poetry and gender studies. The research methodologies are equally varied and include large sample surveys of individuals, content analysis of poetry and qualitative interviews. It appears that Japanese employment practices, once hailed as one of the secrets to Japan’s “miracle” of rapid economic development after World War II, are not keeping up with important changes in Japan’s economy and society under deceleration of economic growth and aging of the population. Nevertheless, the current regulations protect the practices of lifetime employment security and seniority-based wages as a desirable work style. However, these practices not only deter labor market flexibility, but also entail social costs by creating a “wall” that divides insiders and outsiders of firm-specific labor markets, and this leads to large wage disparities. Furthermore, these practices create an “implicit packaged contract” between firms and their employees, allowing the firm wide discretion over employees’ work style, including working hours and job placement. As more women pursue full-time careers, they are being forced into the difficult position of having to choose between their careers outside the home or their children. The difficulty of this decision has resulted in a rapidly declining fertility rate. This paper argues that Japanese employment practices need to be revolutionized to allow better work–life balance and an alternative lifestyle for an increasing number of dual-income families. Keywords: employment practices; insider–outsider conflicts; work–life balance. This paper focuses on institutional barriers to older workers’ continued work beyond the conventional retirement age in contemporary Japan. Under the current institutional arrangements, most older workers in Japan, contending with mandatory retirement rules at the workplace, have the option of being re-employed after mandatory retirement, and experience large wage reductions if they choose this option. We examine how these institutional arrangements in Japan today affect older workers’ views and decisions regarding their future labor market behaviors. Using a multi-nomial logit analysis, we analyze data drawn from a nationally representative sample of 1,400 male regular employees, aged 57 to 59, who participated in the 2007 “Survey on continued employment and occupational life after age 60 (Rokujūsai ikō no keizoku kōyō to shokugyō seikatsu ni kansuru chōsa)”, which was conducted by the Japan Institute for Labour Policy and Training (JILPT). Our analysis has found (i) that older workers do not want to be re-employed if their prospective wages are lower than their desired minimum level; (ii) that, if they choose not to be re-employed, they tend to seek alternative employment opportunities by themselves rather than retiring; and (iii) that, other than prospective wage level, the prospective total income (including “in-work” social security benefits) and the availability of flexible work arrangements are crucial factors affecting the future labor market behaviors of older workers. Keywords: retirement; retirement policies; compensation packages; payment methods; the Law for the Stabilization of Employment of Older Persons (Kōnenreisha koyō antei-hō); re-employment. This paper analyzes a set of 9,035 salaryman senryū poems over an eighteen-year period (1990–2007) in order to track salaryman reactions to workplace transition from an organizational behavioralist perspective. Major findings include: (i) the number of submissions and votes for the major poetry competition, Salaryman Senryū, have been falling since 1994, suggesting a decline in shared salaryman mentality; (ii) there has been a shift in the relative importance of broad themes, so that the workplace as a category of senryū poems is of less centrality in 2007 than it was in 1990; (iii) within the workplace category, (negative) interpersonal relations, especially with supervisors, still dominate; and (iv) workstyle is also a strong subtheme, with workers showing more interest in work processes than actual work conditions. The analysis also shows that the years 1996 and 1997 are a watershed where poems shift from a more jocular to strident tone. The overall implication of the study is a potential breach of the social contract between Japanese employers and regular employees, which will require the assiduous application of supportive employment practices (SEP) in order to ensure a high level of employee performance and engagement. Keywords: Japanese management practices; salaryman senryū poems. This paper is part of a larger study that investigates the cause of increased singlehood among women in Japan. On the basis of findings from qualitative research this paper argues that Japanese corporate practices and culture have severely limited women’s opportunities for romantic encounters. In-depth, open-ended interviews were conducted in the Tokyo area with forty never-married and married women aged 25 to 46. The data were analyzed inductively. The findings reveal that long work hours for men, and in some cases for women, impeded opportunities for women to form romantic relationships in several ways: (i) men were seldom available; (ii) many married women expressed discontent with marriage due to the absence of husbands; many single women held ambivalent views toward marriage after having heard negative stories from married friends; (iii) some single women found it unappealing that corporate men could talk about nothing but work; and (iv) single women with careers regularly worked overtime and their devotion to work was regarded as “unfeminine”. Additionally, workplaces are often segregated by gender, further limiting opportunities for single women to meet potential partners. This paper sheds critical light on the culture and practices of Japanese corporations, arguing that such culture and practices create serious consequences for individuals’ lives. Keywords: Japan; singlehood; gender; gender segregation; corporate culture; employment segregation; romantic relationships; workplace requirements; qualitative research; lifestyle.